Interactive learning with the aid of a computer was the hype of recent years. But as users quickly discovered: learning on a computer monitor is almost as tedious as learning from a book. Media scientist Dr. Martina Lucht from the Fraunhofer Institute for Digital Media Technology IDMT in Ilmenau found the solution to this problem on the street, so to speak: “I found my inspiration one day when I saw a hopscotch game drawn on the sidewalk,” she recalls. “It suddenly occurred to me that learning has to be combined with movement to make it fun.” The result was HOPSCOTCH, the English name of a game in which children hop between clearly defined boxes on the ground. 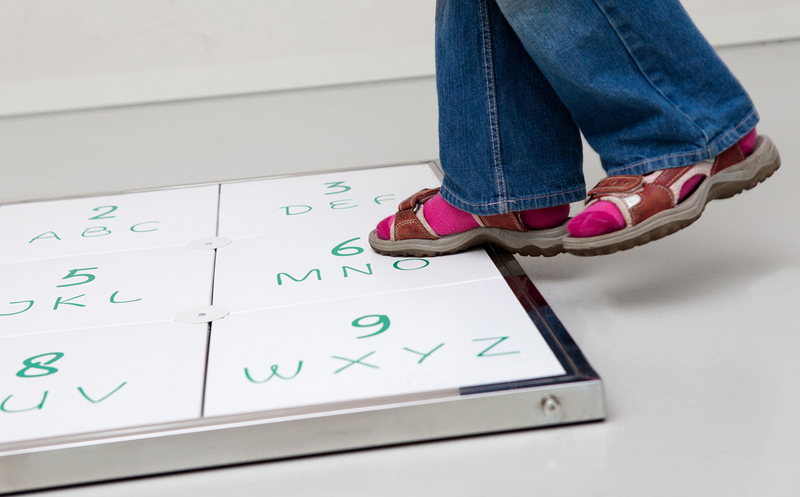 The learning game consists of a sensor mat divided up into nine fields. Each field contains letters and a number, arranged like the keypad of a mobile phone. The user is supposed to complete tasks in certain subjects as these appear on a monitor, such as: “Was heißt Pflaume auf Englisch? [What is the English word for plum? ]” To solve the task, the user has to step on the right fields on the mat in the right sequence to enter words or numbers – like writing a text message on your phone. Initial tests at an elementary school have already demonstrated that all children were enthusiastic participants, particularly hyperactive children. Martina Lucht’s vision is to bring more movement into the classroom. For instance, there could be a HOPSCOTCH period each day that would combine physical education with instruction in language skills.